The so-called First Lady of The United States of America, Michelle Obama, has a few skeletons of her own that she needs to explain away. Last spring as I was collecting the many addresses and social security numbers that Barack Obama has been using for several years, an interesting anomaly popped up. It was a discovery that Michelle Obama has been using several bogus social security numbers, and some are attached to actual living persons. 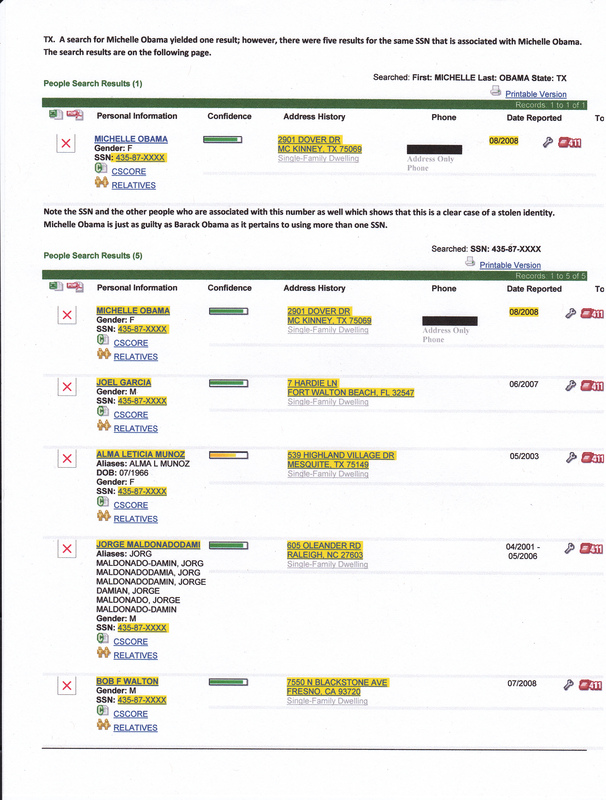 A search from the state of TX for Michelle Obama yielded one hit for the SSN 435-87-XXXX, and it clearly shows a link to Michelle Obama and five separate listings for the same SSN. Also note the date of her connection to this number in 08/2008, the same year as the presidential election. Below is just one example of the many social security numbers that Michelle Obama has been connected with since 2008, the summer before Obama’s historical election. The address is located at Dover Dr. in McKinney, TX which is a valid address. Michelle Obama yielded one hit in Texas for the SSN 435-87-xxxx. It clearly shows a link to her and FIVE separate listings for the SAME SSN. Why was Michelle Obama using this bogus SSN? Why is her name associated with this address in McKinney, TX? Clearly there is a history of the Obamas using fraudulent social security numbers in an attempt to hide what they have been doing for several years, and what that is, only they can answer. Since my discovery earlier this spring of the additional Obama social security numbers and the additional addresses for the Obama’s spanning the United States, one can only wonder as to what their activities were leading up to the 2008 Presidential election. It is well known that the Obamas were assisted in their presidential efforts by organizations such as ACORN, and SEIU. Many other organizations have come under scrutiny for their activities associated with voter fraud across many states leading up to Obama’s historic election in 2008. The data does not lie. Q. Why has the MSM and the United States Congress failed the American people in properly vetting these people for what they truly are? Our thanks to Al at Obamahustle for his investigative work in uncovering the criminal use of fraudulent Social Security Numbers by the Obamas including Barack, Omar, and Michelle. You are familiar with Barack’s alias Harrison J. Bounel, aren’t you? His work also found that the Chicago property that the Obamas claim as theirs, 5046 S. Greenwood Ave., does not belong to them. The actual owner is a Trust from the Northern Trust Co., Trust # 10209. This is the same property that taxpayers are on the hook for paying 24/7 security. Amazingly, when Chicago officials were questioned, they stated there were no taxes paid by the Obamas. Yet, when I examined the Obama’s 2009 tax form, the Obamas stated “under penalty of law” they paid $22,456 on some property (pin numbers identifying the property were redacted ). Add Real Estate and Tax Fraud to Social Security Fraud for the first criminal couple residing at 1600 Pennsylvania Avenue, Washington, D. C. (If you can’t find them there, try one of their other 50+ addresses! ).